Good evening god folks out there on the interweb. 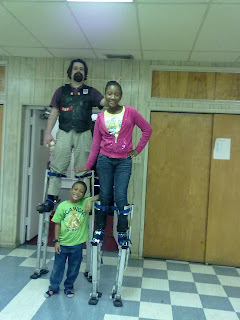 At our last practice we spent some time on stilts. This is myself and a young woman who is doing very well at this. In a few months is is probably going to be juggling on them. In a year or so she will probably be better than me. The little guy is her younger brother. He is a great help when we are practicing on the stilts. When ever we drop something he trows it up to us. This is a really great time saver. The Brigade will be participating in the African American Heritage Day Parade. It will be on the 6th of October from the Civil Arena to the August Wilson Center. The Brigade has not done a parade on our own for years. We have done several parades with the COAI and one misguided effort Community Clown Council. So the majority of our folks have already done a parade. Thus far almost everyone in our Brigade has sign up to do this event. So this should be a good one for us. Also we will be have two of the younger folks in our groups along with us for the first time. The minimum age to join the Brigade is seven. We have let a couple six year old slide in. For the event we will have a five year old and three year old. Now of course both of the kids have come to several practices with their older siblings so they are familiar with clowning. In the circus kids of this age would be in parade with their parents. So in our group they will be in parades with their older siblings. This should be a fun event. I like juggling, making balloon and hate juggling clubs. I working on stilts and are at seven foot one now. I have been a clown for four years now. With a couple of phone calls and a new pace we once again have a knitting group. The Steel City Clown Brigade will be knitting on a regular basis. For the moment we will be knitting on the third Saturday of the month at 5:00PM at the subway on the South Side. This is a practice video of one of our young folks on the stilts.